I have been a fan of Mario Batali since his "Molto Mario" days on the FoodNetwork. I have also been lucky enough to see him in person on two occasions: once at The Metropolitan Cooking Show in Atlanta, GA and then again when I visited his swanky Italian eatery, Babbo, in Greenwich Village in NYC. Both experiences were incredible "once in a lifetime" types because I got to see this Italian expert in action. Last November, I decided to visit a girlfriend of mine in NYC for a weekend and my mom had told me about this neat new Italian market, in part created by Mario Batali, that I just couldn't miss. 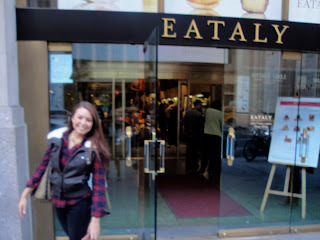 So when we had a little down time, we headed over to 200 5th Ave to check out what Eataly was all about. Not only was the market packed with ungodly amounts of gourmet Italian food and products, it was crawling with people, resembling what happens when you disturb an ant hill. I was so surprised by the sheer largeness of the space, especially in NYC. It was of comparable size to many of the markets I encounter down here in Tallahassee! It was sectioned off like any other market with your typical sauce isles, meat counter, and sweets, but what was really neat was the fresh pasta bar. 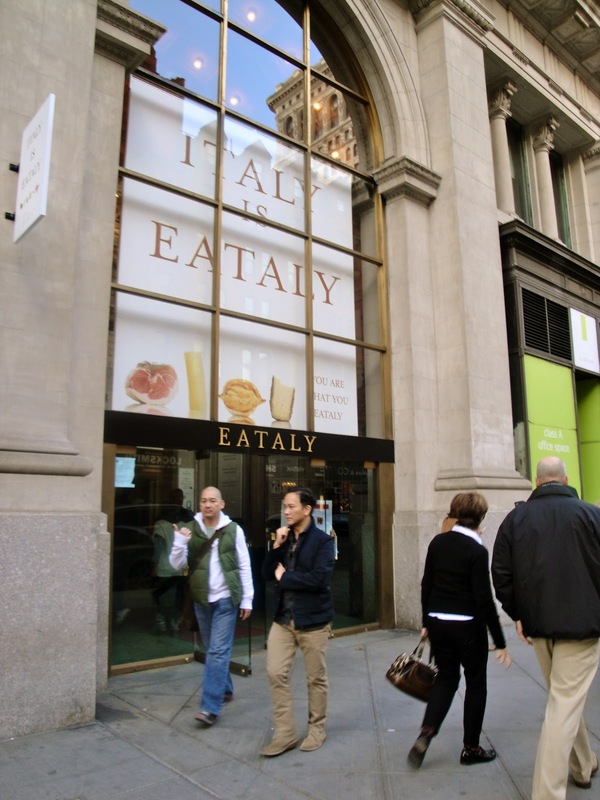 What really puts the "eat" in Eataly, is the fresh-to-order, cafe style sitting area. There is a panini bar, salad buffet, and even a small menu to choose from with other small plates and pastas. Unfortunately, it was so difficult to move because of the mass of people flooding all areas of the market that I had to transform into a serious power shopper to get in and get out unharmed. I managed to navigate passed the towers of panettone and mile long line for fresh gelato to get to the non-perishable area of the store. Nearly everything has been imported directly from the motherland which makes makes this place incredibly special, but also a little bit pricier. If you don't want to shell out the cash to make a truly authentic Italian meal (or don't live in NYC), you can always gather a couple of small but unique non-perishable ingredients (like their amazing tomato jam) to take home with you or put in a gift basket for someone special, like I did! I picked up a couple of fresh pastas in shapes not normally found, some interesting jams with different flavor combinations, a really nice package of extra virgin olive oil varietals, a jar of peaches marinated in moscato wine, Italian green tea with different Italian honey varieties, and a small jar of really good pesto. An interesting packing situation and a hefty fed ex expense and I was able to get it all back to my hometown of Atlanta intact. I prettied up the goodies in a rustic wicker basket and snuck it under the tree last Christmas for my mom. Needless to say she was completely surprised and has since almost used her entire basket! So, if you're ever in NYC be sure to check out Eataly, a truly one of a kind experience that brings you the closest to eating in Italy that I've ever seen. But if you can't make a trip soon enough to the concrete jungle or if you don't feel like braving the cold weather in the city, Eataly lets you shop online at the website for a good deal of their merchandise. Check out Eataly Online! in between the swarms of people entering and exiting! UPDATE: Check out the latest FoodNetwork Magazine for a more comprehensive write up about Eataly and all it has to offer!